Side 1 printed with 1 PMS color using light coverage. 150lb Manila Tag stock uncoated. Written in bold letters, the words "Four Points" stand out and draw attention to the compass behind them—alluding to the company's work with New Orleans homebuyers. Its script slogan adds a personal touch, while contact info is discreetly written in smaller text. On the back panel, a series of forms help buyers track important information related to their purchase, such as inspection reports, loan details, and the seller's contact information. 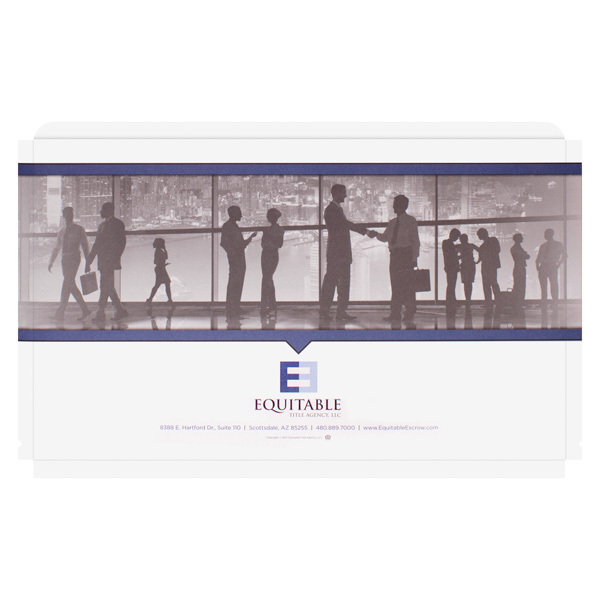 This reinforced file folder design from Equitable Tile Agency features the same image — a group of business colleagues exchanging ideas — on both the front and back. The black-and-white photo combined with the muted blue graphics creates a sense of no-nonsense professionalism. Legal packets and contracts have a way of growing quickly—so you need a product that grows with them. Unsealed gussets give this extra-large pouch room to lay flat while housing anywhere from one sheet to a 1" stack of legal documents sized 8 1/2" x 14". A filing tab at the top measures 1/2" wide and is reinforced to withstand the shuffling that occurs in crowded filing cabinets. 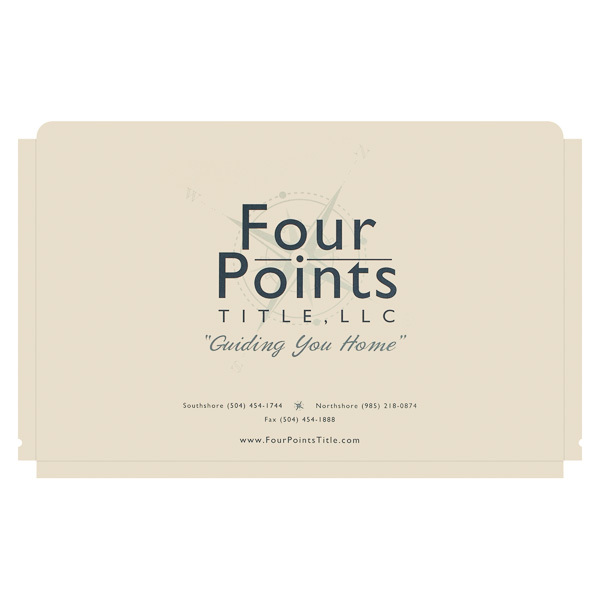 At 14 3/4" long, the tab offers ample room to include your brand's name, contact information, logo, or other copy. Dimension Closed: 14 3/4" x 9 1/2"